Of the many factors related to accurate shooting, wind is the trickiest, as wind can change frequently and can even be different between distances due to topography. While velocity and bullet drop can be calculated fairly easily with the proper numbers, how wind affects bullet trajectory must be determined through years of experience, unless using the Wind Kit available with Ballistic. The Ballistic Wind Kit uses the JBM ballistic engine’s wind capabilities to allow shooters to account for nearly any possible wind situation. 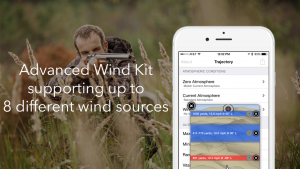 In fact, the wind kit allows users to quickly program the most complex wind scenarios. Most ballistic applications provide only calculations for a constant wind for the full shooting distance, such as 10 mph out to 1,000 yards. However, wind can change between distances, especially long distances, as hills, trees, buildings and more force wind to shift. Then there are updrafts, local winds, prevailing winds and more, all of which can change a bullet’s trajectory and point of impact. This is the main benefit of Ballistic; users can enter up to 8 different wind variable situations between shooter and a target to calculate where to hold a rifle for a first shot hit each and every time. Most people can simply enable atmosphere or upload up to 2 external data readings (including being able to pair with a kestrel via Bluetooth), to determine the majority of the weather conditions, including wind speed. From there users only have to enter direction of the wind according to their location, and check the wind drift chart under the chosen load. However, those interested in shooting long distances in complex situations can tap on Wind Configuration and add up to eight different winds, including an upwind, and Ballistic will calculate the hold. Both direction and speed can be entered, as well as the distance in which the wind is active, such as a 10 mph crosswind from zero to 400 yards, followed by a 9 mph headwind from 500 yards to a 1,000-yard target, or up to seven different scenarios that can be completely customized by users. The best way to learn how to use Ballistic is with experience, however, getting started is easy through the numerous Hot-To videos developed by Ballistic, including one on the Advanced Wind Kit (www.youtube.com/watch?v=hHxhIZHUUsA). To learn more about Ballistic, along with tips on how to use Ballistic to improve shooting, go to Ballisticapp.com, and Ballistic’s YouTube page.